The Panel de Pon universe (パネルでポン, Panel de Pon) refers to the Super Smash Bros. series' collection of properties that hail from the Panel de Pon series of puzzle games developed and published by Nintendo. Since the series' debut in Japan, it has been re-branded internationally under several names, such as Tetris Attack and Puzzle League. 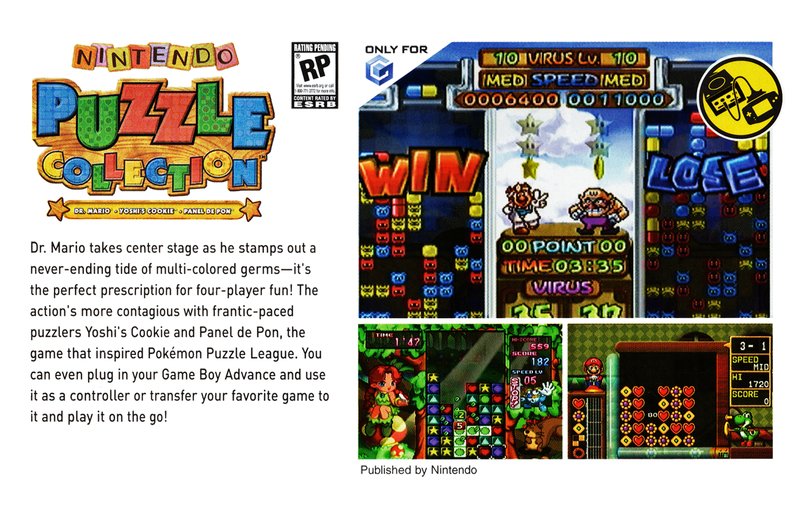 Panel de Pon is a tile-matching puzzle game series developed by Intelligent Systems, where gameplay involves matching three or more tiles of the same color at once to remove them from play. The first game in the series was released on the Super Famicom in Japan in 1995, and starred a series of fairies as its main characters. Its storyline involved the Fairy of Flowers, Lip, setting out to free her friends from the control of the demon king Thanatos and save the world of the fairies. In bringing the game outside of Japan, Panel de Pon's original characters were completely replaced by the cast of Super Mario World 2: Yoshi's Island, and it was renamed Tetris Attack (referencing the name of unrelated puzzle series Tetris), setting the precedent of keeping the Panel de Pon gameplay but replacing its characters. The next three releases of the series, Tetris Attack on Game Boy, Pokémon Puzzle Challenge, and Pokémon Puzzle League, continued to use other series' characters, specifically those of the Yoshi and Pokémon series. Pokémon Puzzle Challenge was originally going to have the fairy cast which ended up with a lot of unused content. Lip can be seen in the game by inputting a specific button combination (which works in non-Japanese versions as well.) The last of these three also introduced the most recent English title for the series, Puzzle League. The last game in the series to use the fairy-based theme of the original game was the version of Panel de Pon included in the Japan-only Nintendo Puzzle Collection for Nintendo GameCube. This version of the game starred a new generation of fairies similar to those of the Super Famicom game; Nintendo Puzzle Collection was planned to release outside of Japan but was cancelled for unknown reasons, the game was rated on the ESRB ratings board. Since then, the next two games in the series (Dr. Mario & Puzzle League and Planet Puzzle League) featured no characters at all (barring a Japan-only cameo of Lip, and the Flower Fairy Mascot of the second generation of fairies, Pupuri and a few backgrounds), merely the gameplay without any story or other series' theming. After nearly a decade of absence, the series made a reappearance as a minigame in Animal Crossing: New Leaf - Welcome amiibo under the name Animal Crossing Puzzle League, featuring that game's characters. Playing the minigame lets the player unlock various pieces of clothing based on Lip's outfit for their villager to wear. The signature item of Lip, the fairy protagonist of the series, appears as the Lip's Stick item beginning in this game. Lip's Stick: Inflicts a flower effect on an opponent upon contact. Beginning in Melee, Kirby's Stone move uses Lip's garbage block as one of its possible designs. The Flower effect is representative of the flowers seen in the Panel de Pon title screen. Other causes for the flower effect other than Lip's Stick includes some of Crazy Hand's attacks or the when Togepi is summoned using Leech Seed from the Poké ball item. The Lip's Stick returns as an item in this game. Additionally, Lip's Theme (Panel de Pon), a remix originating from the first game of the series, appears as a track in My Music for PictoChat. There are also several stickers of characters from the series, including Furil, Pure, Sala, and Cecil. However the fairies are named incorrectly in non-Japanese versions of the game as Lip, Ruby, Elias, and Seren respectively from the original Super Famicom version of the game. However it is possible that these are the names were used for Nintendo Puzzle Collection as it was originally going to have release outside of Japan but was cancelled. Equiping the Flower Fairy Lip sticker in Subspace Emissary will grant the player Lip's Stick. Lastly, the Panel appears as a sticker in the game (using the Heart design) which is the tiles you moved around as the name of the series suggests; in English rebranded localizations of the game, the Panel de Pon games usually refers to them as a Block. Likely due to the fact that the Panels are not mentioned in those rebranded names outside of Japan. Lip's Stick: Returns as an item in this game. Lip's Theme (Panel de Pon): An unlockable arrangement of Lip's Theme from Panel de Pon is used in the PictoChat stage. Lip's garbage block returns in Brawl as one of its possible designs for Kirby's Stone move. Kirby's Stone move using Lip's Garbage Block in Brawl. While there was no new content for the Panel de Pon series, the Lip's Stick returns once again as an item in this game, and the Lip's Theme (Panel de Pon) remix reappears in Super Smash Bros. for Wii U, on the Wrecking Crew stage. Lip's Theme (Panel de Pon): The remix returns as a default song in the Wrecking Crew stage. Only on the Wii U version. Lip's garbage block returns in SSB4 as one of its possible designs for Kirby's Stone move. The Flower effect returns as an effect in this game. The aliment can also be turned on throughout the whole match when going to Special Smash within the Wii U version. Lip makes her first onscreen appearance in the Smash series as a Support Spirit. She is also the basis for a costume for Mii Swordfighters and a Friend Icon for online play. The appearance of the flower effect has been changed, now resembling those seen on the title screen of Panel de Pon. Lip's Stick also returns as an item. Lip's garbage block returns in Ultimate as one of its possible designs for Kirby's Stone move. The Mii Swordfighter can wear Lip's outfit in this game. Lip appears as an Assist Spirit, equipping her will allow you start the match with the Lip's Stick item. The Flower effect returns as an effect in this game, it was redesigned to now resemble the flowers seen in the Panel de Pon title screen. The aliment can also be turned on throughout the whole match within the Custom Smash mode. "Lip's Theme - Panel de Pon": A remix of Lip's theme from Panel de Pon, returns from Brawl. The updated flower as seen on Mario, Pac-Man, and Sonic. Although there are no playable characters in the Panel de Pon universe for the Super Smash Bros. series, some of the characters that were playable in some of Panel de Pon's rebranded games are playable characters such as Yoshi and Bowser from Tetris Attack, Pikachu and Pichu from Pokémon Puzzle Challenge, Squirtle and Mewtwo from Pokémon Puzzle League, and Villager from Animal Crossing: New Leaf - Welcome Amiibo's Puzzle League minigame. Non-playable character Isabelle from Animal Crossing: New Leaf - Welcome Amiibo's Puzzle League minigame is also playable in the Super Smash Bros. series. Jigglypuff also cameos in Pokémon Puzzle League and Pokémon Puzzle Challenge, acting as the stop timer in these games. Since Furil, Pure, Sala, and Cecil from Nintendo Puzzle Collection have appeared as stickers in Super Smash Bros. Brawl, this would mean the first Panel de Pon game would be the last unrepresented cast from the series without an appearance until Lip's Assist Spirit in Ultimate. (Dr. Mario & Puzzle League and the Japanese version Planet Puzzle League had very little character representation; however, it had cameos of Pupuri and Lip respectively but they were both characters from previous games). Both of these characters also has a physical appearance outside of Japan in the form of selecting image option 4 in Dr. Mario & Puzzle League and Pokémon Puzzle Challenge's Button Code respectively. This page was last edited on April 5, 2019, at 16:54.